Radon monitoring equipment for Radon risk assessment in NORM and nuclear industries (mining, nuclear waste disposals, oil and gas industry, and so on). In the nuclear industry, Radon has to be monitored, from mining activities to nuclear waste disposal, mainly for health physics and quality control purposes. Naturally occurring radioactive materials and manmade increased human exposure to ionizing radiation are referred to as ”NORM”. Radon is one of its main representatives. Workers in uranium mines are exposed to NORM found in the uranium orebody. NORM (including Radon) results also from activities such as burning coal, processing fertilizers, oil and gas production, and fracking. The major sources of Radon from these industries are the disposal of Norm residues containing Radon releasing material; water and natural gas containing absorbed Radon by passing through Radon prone underground areas; – solar heating systems using Radon-emitting rocks to store heat; – granite rocks; – uranium or phosphate mine tailings. NORM residues can be used as building materials and so may contribute to the accumulation of this gas in homes. The AlphaGUARD radon detector and AlphaE radon monitor can enhance continuous monitoring systems in work areas by warning of excessive Radon and can provide useful expertise in the Radon characterization of building materials. 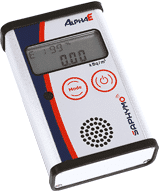 AlphaGUARD is a portable radon monitor with high sensitivity and outstanding accuracy. It is the benchmark instrument for professional radon monitoring.